Now I know what you’re thinking, homemade from the Dollar Tree? Yes, sir. Affordable, amazing homemade stuffing with ingredients you can buy for a hundred pennies. Why not save a buck for the holidays? Which came first? The Chicken or the egg? Well, in this case, stuffing came first. It wasn’t until the 1850’s that we started referring to the same dish as dressing. As far as stuffing/dressing becoming a regular staple of the Thanksgiving Day meal, there are written records as far back as 1836. This specific recipe is for Homemade Stuffing Cubes. You can use this recipe in your favorite stuffing or dressing recipe. Do you like to add celery, raisins, sausage? The possibilities are endless. I’ll share 7 of my favorite recipes to use your homemade stuffing cubes below. The Dollar Tree now sells Nature’s Own bread which has No High Fructose Corn Syrup or GMO’s, this is the preferred bread I like to use in my recipe. Set oven temp to broil and wait to rise to temperature. Place bread cubes on a lined cookie sheet in the oven and keep an eye on it. Once the stuffing cubes start to brown, flip over with a spatula to brown the other side. Whether you like savory or sweet stuffing, I have the perfect recipes for you, including one that’s gluten-free! The last thing we want to do is poison our friends and family for the holidays or any day for that matter. Food safety and the proper temperature is extremely important when dealing with raw meat. If stuffing is prepared ahead of time, it must be cooked immediately and refrigerated in shallow containers. Do not stuff whole poultry with cooked stuffing. Refrigerate the cooked turkey and stuffing within 2 hours after cooking. Place leftovers in shallow containers and use within 3 to 4 days. Reheat leftovers to a safe minimum internal temperature of 165 °F. 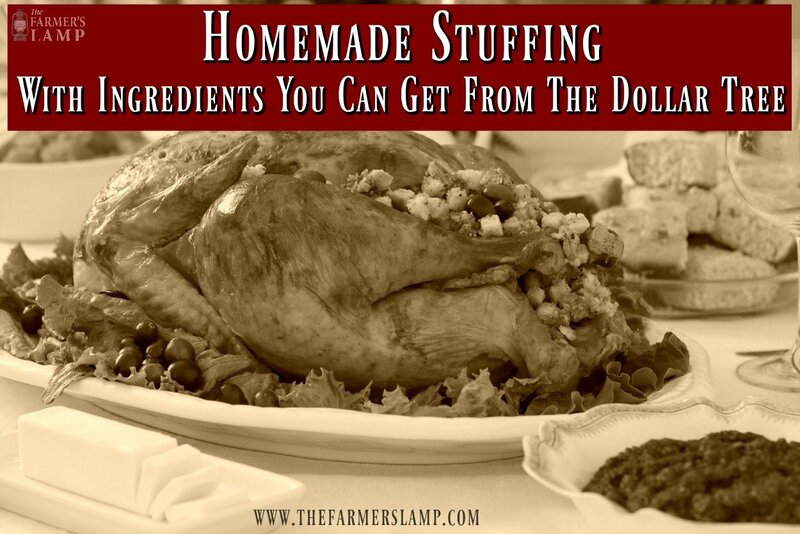 What Is Your Favorite Way To Make Stuffing? Over the years I’ve used several different recipes. Homemade bread, cornbread, from a box and sem-homemade. I’ve added roasted chestnuts and golden raisins. I’ve teamed up with other websites to provide some fugal holiday recipes and crafts for you. Disclaimer: **I was compensated for this post. This post also contains affiliate links and I will be compensated if you make a purchase after clicking on my links at no additional cost to you. 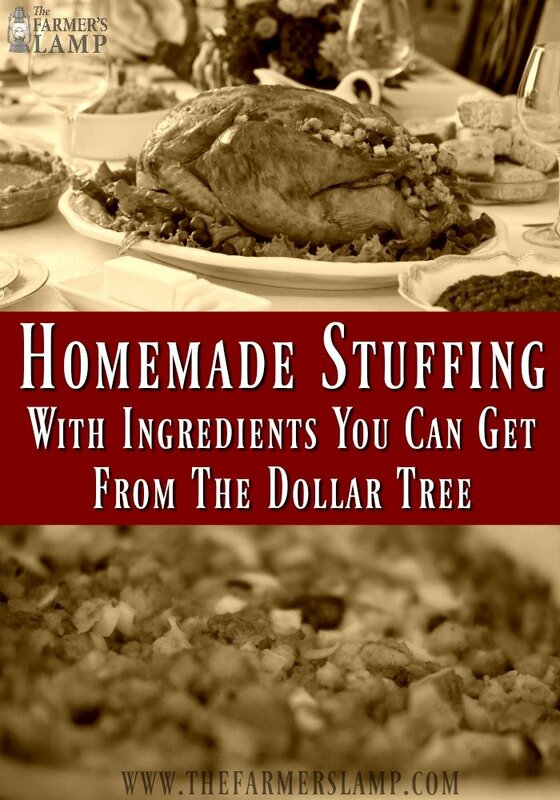 This stuffing looks amazing and I love that it was made with Dollar Tree ingredients. Btw: That’s our favorite bread too. <3 I had no idea they had it at Dollar Tree so that's VERY good news! Thank you for this recipe – I never thought to pick up spices at Dollar Tree, what a great idea! I enjoyed the little history lesson too! We call it stuffing, but we don’t stuff the bird.